Harvesting a spiritual journal is powerful and what I call the “secret sauce” to reaping benefits from the practice of keeping a journal. In June we have been exploring the various aspects of spiritual journaling on the Tending the Holy Thursdays. And don’t forget I created a free resource for you called Keeping a Spiritual Journal Tip Sheet. You can get this free by clicking on the button at the end of the post. It is my hope and prayer that this series and the tip sheet will enhance your walk with God. I would love to have more email subscribers and to connect with you on social media. So if you don’t get Healthy Spirituality in your inbox, don’t forget to sign up. Community is also an important aspect of our faith walk. 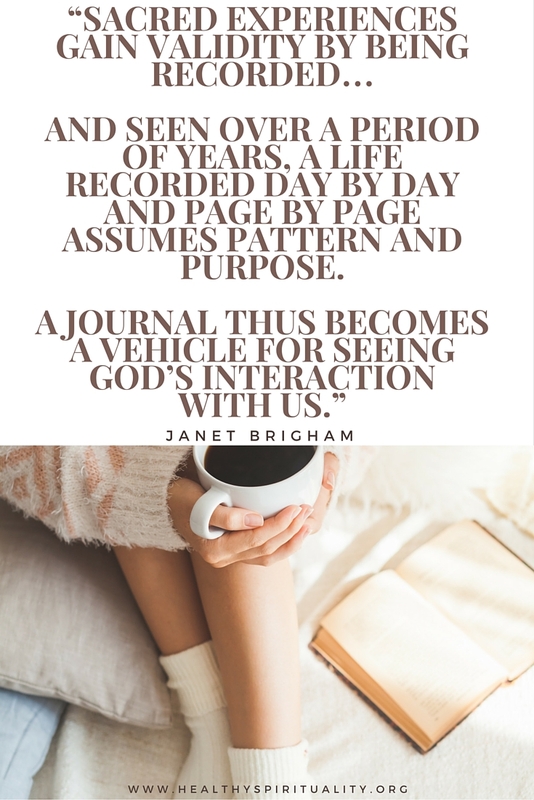 Rereading and reviewing your journal writings offers insights, deepening perspectives, and a clear vision of God’s active participation in our daily life. Would you till a garden, plant seeds, weed diligently and fertilize faithfully – and then forget to harvest the fruits of your work? Of course not. But many people who keep journals of their thoughts, prayers, and events of their lives miss out on the joys and lessons that come from rereading or harvesting their journal. When to Harvest a Spiritual Journal? When do you harvest a journal? It is up to you. Monthly, quarterly or even yearly. I always open in prayer that God opens my eyes and heart to see him revealed in the words. I usually reread my journal at the start of a retreat to acclimate myself to where I have been and where I am now. For more than 20 years, I conclude each calendar year reviewing the past year, creating a summary list of what I have written, then prayerfully recording my hopes and dreams for the coming year as I feel God is leading me. I mark significant passages – highlighters or colored ink are wonderful such gifts! I look for trends and patterns. Asking questions is another powerful tool to harvesting a journal. What lessons did God teach me this year? Does a single word or phrase jump out? Is there a recurring theme, such as discouragement or anger and is there any insight to this repeating affliction? Has something been left undone? A forgotten joy experienced? A few years ago I was overwhelmingly discontented with my job and couldn’t understand my discouragement. While reviewing every journal entry concerning my work, I discovered I was only concentrating on the things I didn’t like about my job instead of balancing it with the enjoyable aspects. Studying my thoughts, feelings and experience with my job gave me new perspective and clarity about my call in life. I write out many of my prayers in my journal so when I reread them often I am overwhelmed on how they were answered or gain insight as what at first glance I think may be unanswered prayer yields its lesson. I have been often overwhelmed by thankfulness by rereading several months and even years of the list of things for which I am thankful. I’ve given God thanks for family, cool autumn days, restful weekends, words of encouragement, fellowship of friends, strawberries and blueberries, sunshine and surprises. Repeatedly I have written “forgive my sharp tongue and lack of witness.” Seeing this over and over has intensified my confession of sins and renewed my commitment to do God’s will with a more open heart. I have also written a statement of my beliefs and a Rule of Life which produces challenging questions when harvesting my journal. Am I keeping my commitment to what I say I believe? How am I living according to my values? I then refocused my intention back to God and what is important in life. We all need help in taking out the “garbage” in our lives. Garbage such as loneliness, bitterness, anger, discouragement, memories and unattended needs. Writing out and later rereading these concerns encourages us to better let and let God do God’s work of healing in our lives. Once as I reread concerns that has spilled out on my journal pages, I discovered what I had really been doing was whining. “Lord I never get my way,” “Someone or something is always pulling at me.” “I just don’t understand why this happened.” Naming my feelings as a childish belly-aching helped me get over those negative emotions. Harvest time is a time of joy and celebration – the rewards of sowing words. You reap balance and knowledge that sustain you through the rough times and provide the perspective that reveals God’s hand in your life. 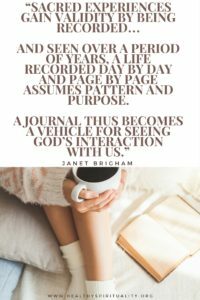 Harvesting a journal is truly the “secret sauce”, the hidden highlight and a key practice in keeping a spiritual journal. I hope you have enjoyed this series about journal writing. I have been amazed at how many of you have downloaded the free Keeping a Spiritual Journal Tip Sheet. Just click the button below if you haven’t already received it. 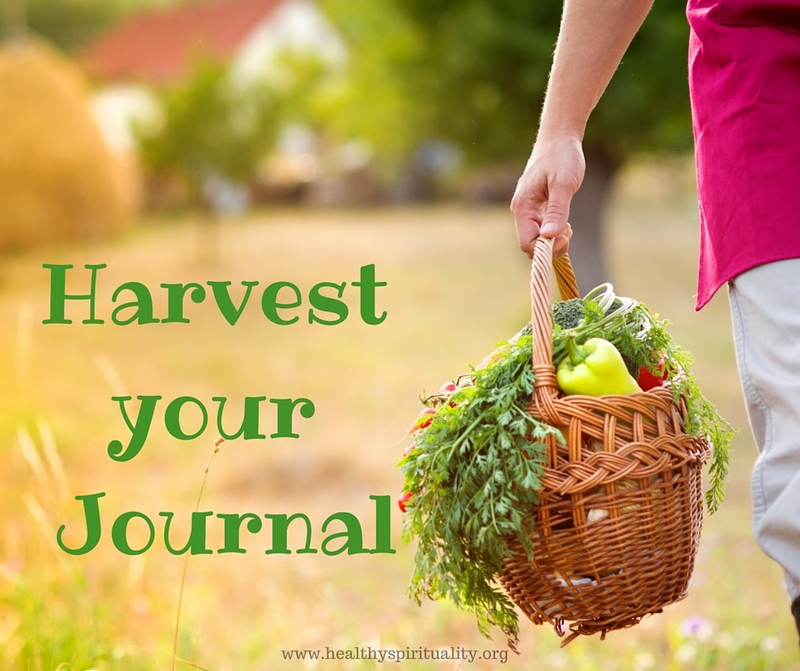 Do any of you harvest your journal? What have your learned by this practice? Wow. I greatly admire the thorough gleaning you accomplish while reviewing your journals. How God must enjoy those precious moments with you, Jean! Personally, I am so thankful for the gratitude journal started years ago. To review God’s provision, protection, and guidance over the decades is such an encouragement and joy! A gratitude journal is powerful. The more I am thankful, the more I see all that I have! Including being thankful for connecting with you. Aw, Jean, what a kind thing to say. The gratitude is mutual! Your posts always speak wisdom to me, and I SO appreciate your thoughtful, supportive comments over at my blog. I pray you have a week full of celestial surprises, my friend! To harvest my journal, I suppose I’ll have to start one in earnest, Jean. 🙂 Thanks for all the wonderful tips on journal writing this month. Blessings! Funny. Some people don’t like or want to journal. I just encourage people to keep it in mind as a practice they may use someday . I like the idea of a tool box of spiritual practices that we can choose from when see need to. Hope your weekend is going fine. Blessings! Our new pastor has encouraged us to bring both a Bible and a journal to worship services so we can take notes. I love this change! I’m sure I’ll be quoting Pastor Diane in the future at my blog.